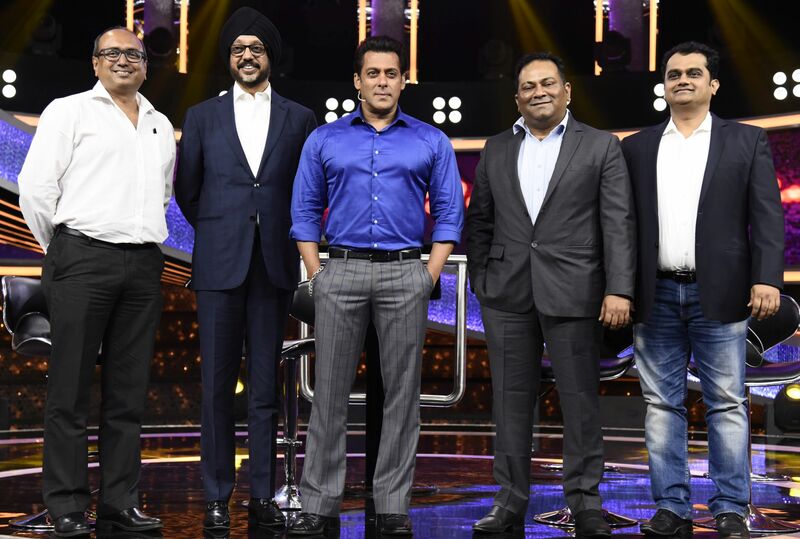 Dus Ka Dum Returns Hosted by Salman Khan, the show premieres this June 4, and airs every Monday & Tuesday at 8:30 PM Only on Sony Entertainment Television. Produced by Big Synergy, this new season of Dus Ka Dum boasts of an all new format re-designed and developed by the in-house creative team of Sony Entertainment Television (SET) and Sony Pictures Television, UK. With its TV + Digital approach, the show promises to deepen engagement with the viewers. The format is simple and appealing giving participants ample time to interact with their beloved star as well as revel in their victories. The first round will see two participants compete through 5 Ka Punch which is a knockout round. The player who answers at least 3 questions correctly out of 5, moves to the next round while the other contestant gets knocked out. Each question in this round is worth Rs. 20,000/- and the contestants will get 15 seconds to lock the estimated percentage on their respective screens. The madat (assist) available in this round will be Strategic Timeout where the contestant can consult with their families to arrive at an answer. Even the eliminated contestant doesn’t go empty handed! The second round is called 10 Guna Dum where the participant stands a chance to multiply the earnings from round one to Do Guna, Chaar Guna, Cheh Guna, Aath Guna or Dus Guna. The contestant has to set an estimate window on the ‘India Meter’ instead of an absolute percentage number. The madats (assists) available in this round are – Andaza Apna Apna, where the contestant can take help from studio audience and Dumdaar Daayra, where the obsolete bracket on the India Meter will be disclosed making it a lot easier for the participant. While the contestant must play all the five questions, a minimum of three right answers in this round leads the contestant to the last and final round which is aptly titled Super Sawaal. This is the most edgy and nail-biting stage in the game! The correct answer gives the contestant 10 times the amount earned in the second round. But the wrong answer will leave the contestant with only 10% of the amount won in the second round. However, the contestant can choose to quit the show if in a dilemma and claim the money won in the second round. Sony Entertainment Television (SET) revolutionized the way content was consumed by introducing the second screen engagement during Kaun Banega Crorepati (KBC) – which was the biggest in the world. 30 million users registered for KBC Play-Along and around 3.5 million concurrent users played-along for every KBC episode, setting a global benchmark. Taking the success and the scale of the 2nd screen initiative a step further, Dus Ka Dum aims to become the most interactive television show in the world. Through the SonyLIV app, the engagement with the audience will happen in three phases viz. ‘Survey’ leading to ‘Audition’ and ‘Play Along’ once the show launches. It is a first in the history of world television that viewers’ insights received will form the backbone for the content in the form of probable questions in the show. Also, users get to keep availing exciting prizes with the Play Along on the SonyLIV app once the show goes on-air.